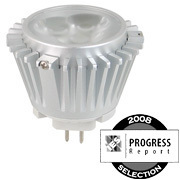 NEW YORK, NY--(Marketwire - November 24, 2008) - LED*Waves, a world-leading manufacturer of high-end LED lights, today announced the company's PAR30 14-Watt, PAR20 8-Watt and MR-16 5-Watt LED lights have been recognized by Illuminating Engineering Society (IES) as unique and significant advancements to the art of science and lighting. "We are very pleased to have LED*Waves' LED bulbs recognized by IES, and to be included in their respected Progress Report," said Joel Slavis, President of LED*Waves. "Their small footprint and exceptional brightness make our bulbs among the highest quality LED lights available in the world." The IES Progress Report recognizes significant product developments and improvements to the lighting industry. The annual report, compiled by the IES Progress Committee, will be published in the January 2009 of Lighting Design and Application (LD + A) magazine. The publication will feature pictures and a description of each product accepted for the report. PAR30 14-Watt, PAR20 8-Watt and MR-16 5-Watt LED lights warrant merit due to their high light output, long lifespan, and capacity to manage thermal energy far better than traditional lighting products. The PAR30 14-Watt represents the latest breakthrough in high output LED light sources, delivering 900 lumens in Cool White (4000 - 4500K) and 720 lumens in Warm White (2800K - 3600K) for unsurpassed performance in any general lighting application. The PAR30 LED is a powerhouse of illumination with a beam spread from 15 degrees to 120 degrees, and is designed to replace a 75-watt halogen bulb. 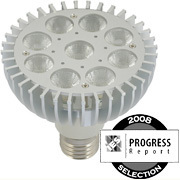 LED*Waves' PAR20 has plug and play compatibility that is ideal for worldwide use. The PAR20's three 3-watt Cree XLamp® XREs create 500 lumens (5000 - 5500K) of Cool White light and 400 lumens (3000 - 3500K) of Warm White light, a perfect replacement for a 50-watt halogen bulb. 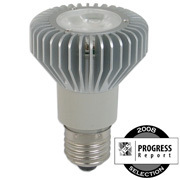 The MR-16 5-Watt is an all-purpose LED bulb that is usable with any low-voltage fixture or system that uses a DC or magnetic transformer. The MR-16 obsoletes a 35-watt halogen bulb with its trio of low-energy 1.3-watt Cree XLamp® XREs that produce 270 lumens (5000 - 5500K) of Cool White light and 240 lumens (3000 - 3500K) of Warm White light. The Illuminating Engineering Society (IES) is the recognized technical authority on illumination. For over 100 years, its objective has been to communicate information on all aspects of good lighting practice to its members, to the lighting community, and to consumers, through a variety of programs, publications, and services. Through technical committees, IES correlates research, investigations, and discussions to guide lighting professionals and lay persons via consensus-based lighting recommendations. LED*Waves is at the forefront of global LED product development and high-end lighting solutions. Specializing in architectural, recessed, and linear LED lighting, LED*Waves' products are powered by LED Chips from Cree, Inc., a manufacture of semi-conductor materials and leader in solid-state lighting. With its PAR-, MR-, and E-Series of LED light bulbs, LED*Waves provides ultra-high brightness LED product lines that satisfy the growing global need to replace traditional lighting with LED technology for general illumination. Among its other benefits, LED*Waves' environmentally responsive LED technology aids in lowering CO2 emissions -- the dominate greenhouse gas contributor to global warming. LED*Waves is headquartered in New York, New York. For more, visit www.ledwaves.com. ©2008 LED*Waves, Inc. All rights reserved. LED*Waves is a registered trademark. All other trademarks mentioned are the property of their respective owners.